Visit Once Again Resale for these brand new in boxes, Hermes Parures des Maharajas Scarf. If you can't afford an actual necklace dripping with excessive diamonds and rubies and emeralds and sapphires. This scarf is a great substitute in my opinion. 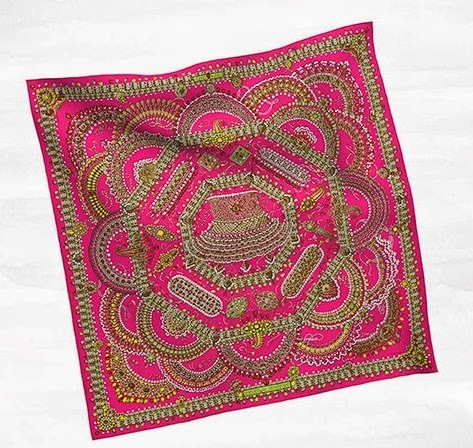 Parures des Maharajas Scarf, love all the color of this print, a unique scarf full of Indian surprises! 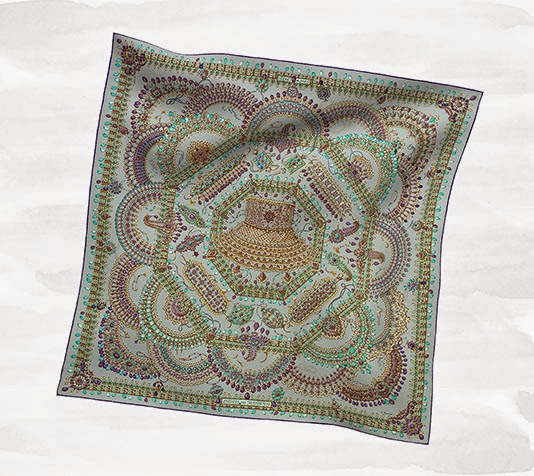 They are from Hermes Autumn/winter 2012 scarf collection, available at the official Hermes website. Why pay full price when you are get a discount at Once Again. We also have this brand new Hermes Charm's Etrier scarf ring in silver and palladium plated which is the perfect companion to your beautiful Hermes silk scarves, allowing versatility, an added touch of class and the ability to wear your scarves in a myriad of different ways.